I have been so off with this Wednesday in Review thing. I apologize. New baby, short staffed… I blame that because it makes me feel better. I will work on making this better and more consistent. 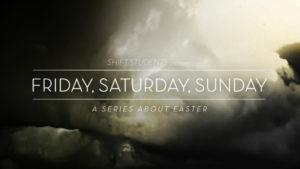 Sermon in a Sentence: Bring your mess to the cross, it changes things. Understandable Message: We talked through the crucifixion and how Jesus was brutally beaten, broken and killed on the cross. He had to go through Friday to get to Sunday. We to will have Fridays in our lives, but it’s usually our darkest times in which comes the greatest victories through Jesus. Element of Fun/Positive Environment: We played Dead Cat. If you have not tried this game, it was a very different but loved game. Favorite Moment: We did a response to the message and teaching students how to come to the cross. Every student got some post it notes. they would write down things they have been holding onto and as a symbol of giving up control to Jesus, they would take the note and stick it to the cross we have in our room. Super powerful and practical.